Fitler Square is the neighborhood surrounding the 1/2 acre public park of the same name. Bounded by 21st Street to the East, the Schuylkill River to the West, Locust Street to the North, and South Street to the South, Fitler Square is a primarily residential neighborhood composed of single-family homes. Located within walking distance of the Center City Business District, the shops at Rittenhouse Square, and the Schuylkill River Trail, Fitler Square is the ideal location for families looking to experience the best of city living within a relatively quiet location. 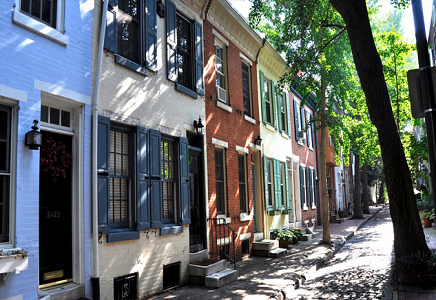 With quaint side streets lined with colorful rowhomes and plenty of opportunities for outdoor recreation, Fitler Square is a highly-desired Philadelphia neighborhood. Fitler Square boasts a median sales price of $730,000, roughly $501 per square foot. Median rent prices are $2,900.